My most recent acquisition from an online auction site. A trip to the West Country is always a pleasure and this one was no exception. 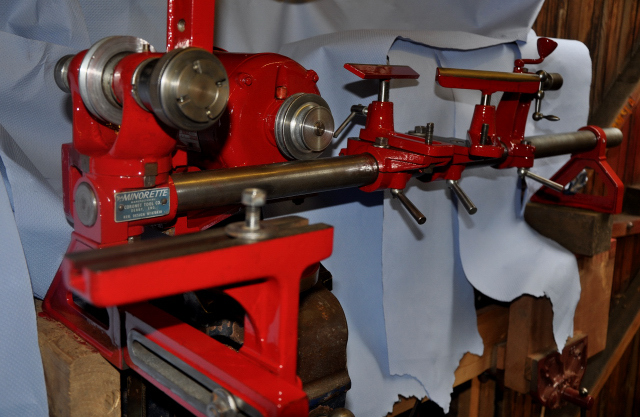 It resulted in the collection of a classic versatile little lathe in great condition. It had clearly been well looked after and only had minor surface rust. The only downside to this trip? No cream tea. One of my favourite West Country tearooms was closed, how thoughtless. 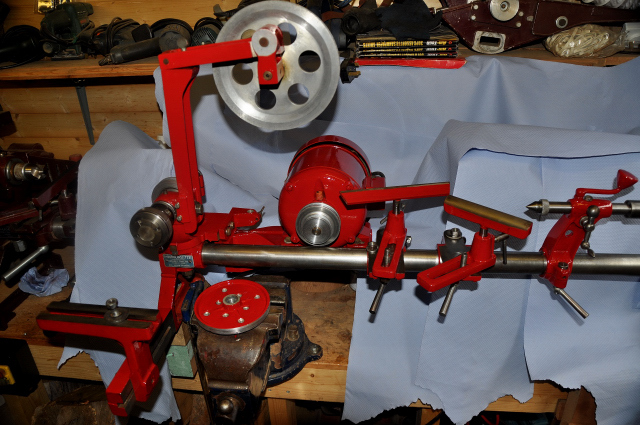 I am only now finishing off the Minor Ten in One and a Majorette is sprawling seductively on the workbench (it's a machine honestly) awaiting my gentle touch. I have decided to send the Minorette out on loan to a trusty Coronet friend nearby. Mr Derek is more than happy to take on the minor restoration of this machine before putting it to use himself and in return, construct a bench for it. It is quite a basic unit consisting of the motor, bed bar, saddle, saw table, combination table and face plate. It also came with two decent saw blades for ripping and crosscutting. You may be able to see my homemade thread protector or rather, broken screw chuck! Better than paying £18 for one of the internet. Below is the Minorette with a couple of extras I am loaning Derek for the duration notably the speed reduction pulley and planer . And below is the bench my trusty mate has knocked up. Note that he has taken the time to let the rails in to the legs. All in all a sturdy construction that will help minimalise any vibration. I am looking forward to seeing this up and running. Mr Derek has sent some new pics which are below. He has cleaned up the Minorette and has mounted it on the bench. Looking good. And note his Coronet Imp lurking proudly in the background. 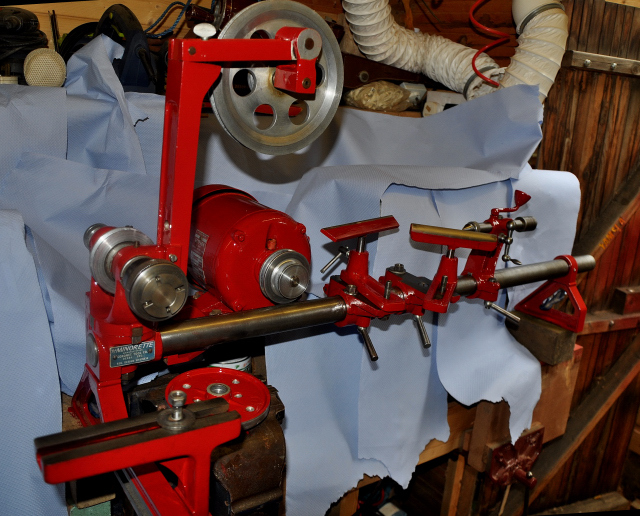 The saw table has come up well as has the planer. Which reminds me I promised him the thicknessing attachment. 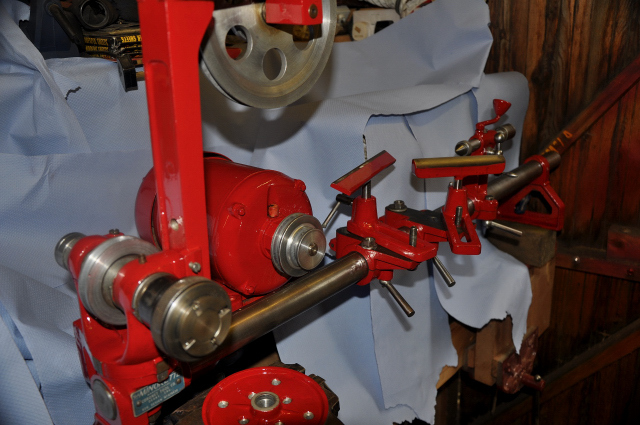 The speed reduction pulley system is set up and fitted on and is awaiting the second belt. I have an original factory switch for him to fit on and also a mortising jig. All said and done he will have a tasty little set up here. Thanks again for your assistance Mr Derek. 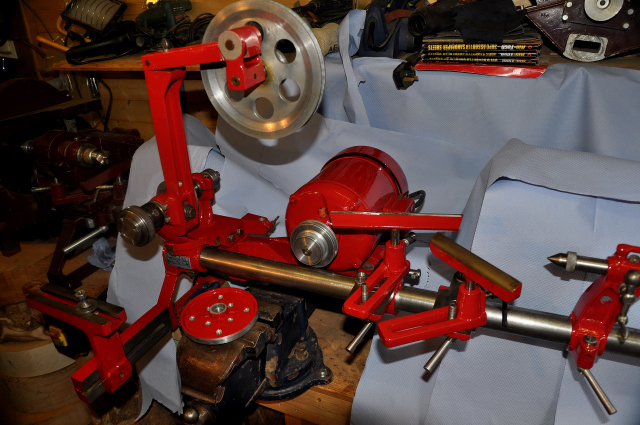 Thanks to Derek the Minorette is set up on the bench and in action but has returned to the Boleyn after he got himself an Axminster adjustable speed lathe. He has been busy producing some excellent bowls. This machine was offered to me through the website and at a decent price so off I went to Cosham to collect it. 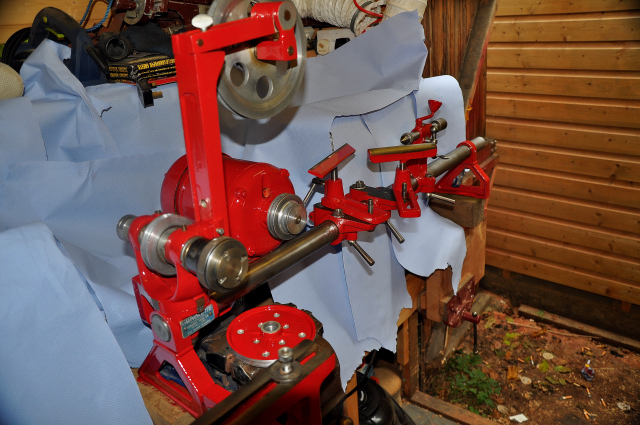 The seller had purchased it for £250.00 six years ago with the intention of starting up a woodworking hobby upon retirement however the machine had sat idle since its arrival on the bench. A decent little unit manufactured in 1969 and as robust as ever. 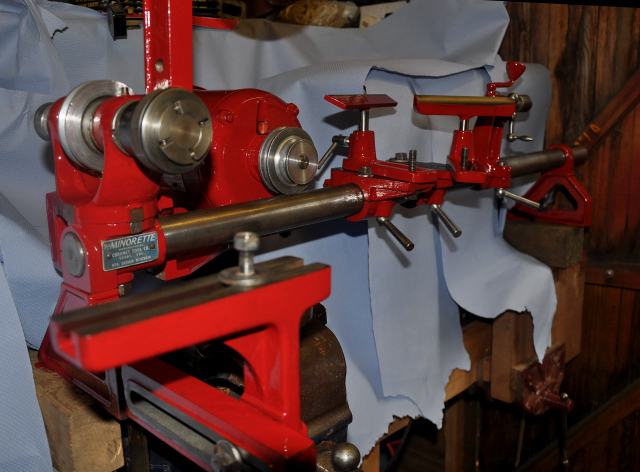 Fortunately it has been kept warm and dry so there is minimal surface rust although the planer is seized temporarily. An ingenious adaptation to the rise and fall mechanism. A standard set of mortising chisels and odd bits. 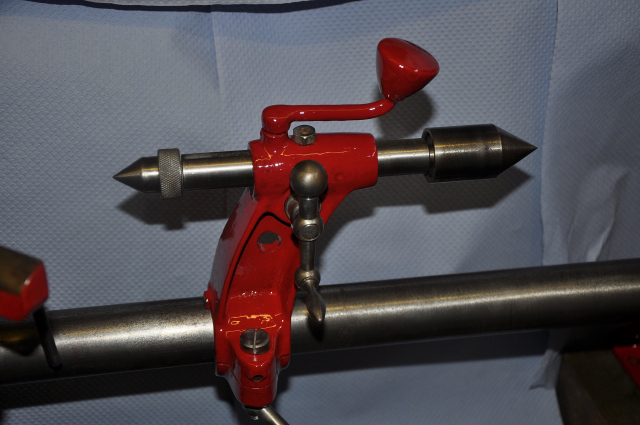 One of the great things about the Coronet Tool Co was their constant improvement and uprating of their machines components. 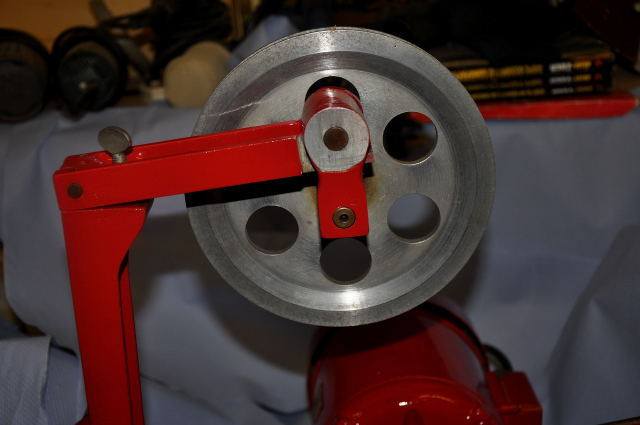 A good example of this is the tailstock for the Minorette which also fits the Minor. Seen below in its naked form. 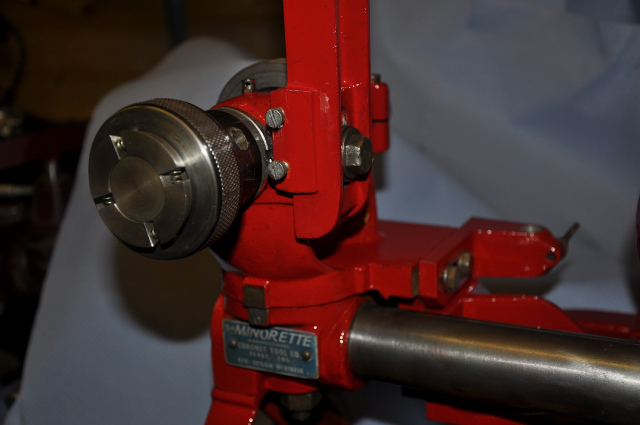 According to the official catalogue this new backset tailstock increases the distance between centres on the Minorette to 11". 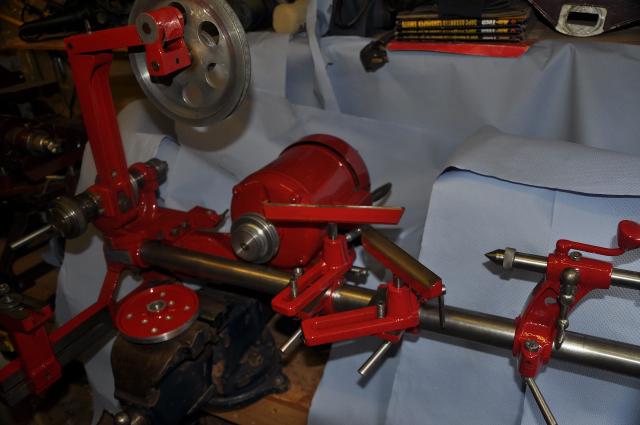 The hollow ram, operated by rack and pinion, is bored to take No1 morse taper at one end and threaded internally at the other to take the screw fittings offered in the catalogue. At first I could not see this thread but after cleaning it became apparent that it was indeed there but damaged. I will get it re-threaded. 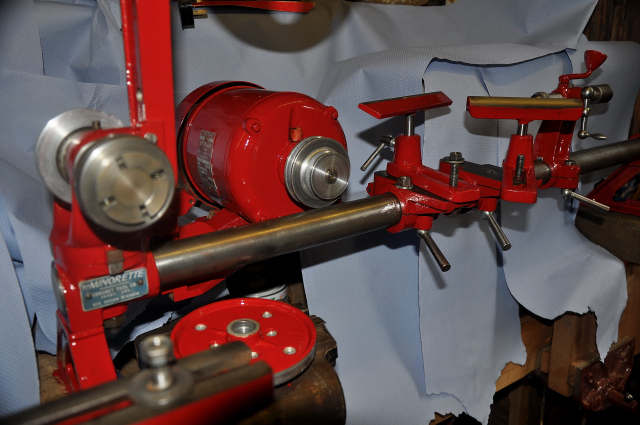 Fittings offered were a ring centre to give the work an accurate location to the hollow centre which is used for cable hole boring and a revolving centre which obviates the need for greasing which can discolour the work. So now you know. You will have seen Ashleys Majors in Readers machines. There were so many pictures that I posted a link to them. But did you know he also has a Minorette? The pictures below are from during renovation. As I have discovered the Picture Gallery feature I have decided to feature them in this format below. In the gallery below that, the post restoration photos. And He wasn't joking when he said he needed a shed extension. Enjoy. 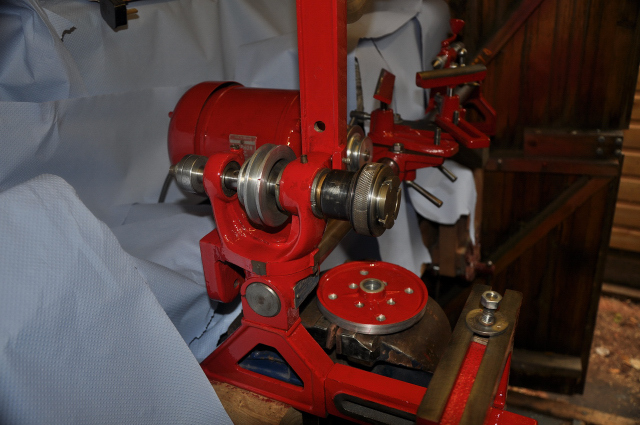 And below are the post restoration photos, many thanks Ashley.